Lakota’s Red Cloud is an Appaloosa cross with a welsh cob type, he is a rising 9-year-old known at home as Toby. Having the Appaloosa breeding means he is not your typical gelding. He has lots of Appaloosa traits. He’s a strong character, can be stubborn and always asks “what’s in it for me?” and “why should I?”. However, he is loving, loyal and thrives on 1-2-1 bonding. Myself and Toby have been a team for just over 4 years, starting off in Dressage and Showing. We didn’t feel that we were progressing enough in the Dressage and Showing and started looking for something new to try. Someone mentioned western riding to me and it was something that intrigue me. It’s an interesting transitions from the English style of riding to western riding but it was a change that both myself and Toby have loved! In the 4 years of dressage and showing, we did really well, and gained lots of rosettes and championships. One thing I did notice though, we struggled to get much further than Prelim level dressage and local level showing. In all honesty, Toby isn’t built for dressage, he is short legged, thick set and struggles with collection and tracking up. As much as he tries, I always felt like it was hard work for him to achieve what others seemed to manage quite easily. I would always be the one working the hardest, trying to hold him together. I had been considering other areas that me and Toby could train in. This was when western riding was mentioned. I did some research, asked a few friends who I know ride western, and watched some videos on social media. I liked what I saw and could relate to the training methods quite easily. There was only one way to find out if it would suit Toby. 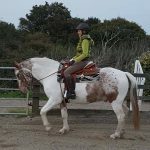 I booked a “Give it a Go” lesson with a Western Trainer, to see if it’s something we could learn. I think the hardest thing for me to do was to loosen and lengthen my rein contact! After years of holding on to the reins to support Toby, as well as clutching on to him when he spooked, I now had nothing! The first thing I noticed was how unbalanced I was as a rider, I relied on the rein contact for stability. When Toby spooked (which was a regular occurrence) I would grab for the rein, rather than using my body and seat to secure myself. First, when a horse rears, bolts, or won’t back up, it’s because he’s over-engaged. He has a wider stance with his hind legs, which gives him a lot of power to resist you. Disengaging his hindquarters takes that power away and keeps you safe. Second, when you can move your horse’s back end as you do in this movement, you can set him up for any maneuver or position. To ask a horse to dis-engage, you bring his head to the inside, having little or no contact on the outside rein. Moving your inside leg back, you push his quarters away. With his inside hind leg, he must step underneath himself, crossing his outside hind. Every time Toby lost concentration, even just looking outside the arena, or spooking I would disengage his hinds. Within a few attempts he figured out that if he did the wrong thing, this movement was repeated, so it was a lot easier to stay focused. For me, this made much more sense to correct him this way. Normally he’d get a flick with the schooling whip, which he’d just ignored! That western riding lesson was one of the best lesson I had ever had! Toby was listening and felt like he wanted to learn more. My stubborn little spotty pony was finally working with me! I even stopped needing my schooling whip, as he became more reactive to my leg. That was almost 12 months ago, I can say I haven’t regretted a single moment after moving over to Western training. Not only has it encouraged Toby to enjoy work. He’s become suppler and movable. The groundwork has helped me become a better leader both in and out of the saddle. After training throughout 2017, this year, we plan to start putting our work into practice. Attending some training clinics and western shows. I would like to work towards trail classes, but for now, I am happy that we have finally found something that we both love! Emma has been riding for 20+ years. She started off riding dressage, with a small amount of jumping. With Toby at her side she’s been building up her confidence in riding again after loosing it a few years ago. She & Toby are hoping to get out to some western shows this year. She also works full time, plus run a business with her partner and enjoys modifying cars and attending car shows.